FORT RUCKER, Ala. (Feb. 12, 2016) -- Bullying isn't a new issue, but with social media so prevalent in children's lives, it's a different world than parents were used to growing up. That's why the Fort Rucker Youth Center wanted to combat bullying with its "Sheroes and Heroes" anti-bullying campaign, which highlighted the effect that bullying can have on not only the one being bullied, but the bully, as well, said LaShia Brooks, youth technology lab program associate for the Fort Rucker youth center. "We want to make the children here more aware of the seriousness of bullying, so we wanted to shed some light on what bullying really is," she said. Brooks said the idea came up when she caught an incident of bullying where one of the teens at the youth center was caught recording another without her knowledge. "The other children were laughing at her, so when I caught the incident, I approached the child who was recording and asked her to delete the video," she said. "They might not have been aware of it, but that's a type of bullying that they were participating in, and that's why we wanted to have a night like this. The children participated in a two-hour session where they heard from various guest speakers, from a lawyer to police officers to school counselors, and they were able to hear stories of bullying, not only from an outside perspective, but from a personal perspective, as well. They were able to learn that there are multiple types of bullying, including physical, verbal, emotional, sexual, prejudicial and even cyber bullying. "Nobody has the right to bully anyone," said Jerry Sapp, Ozark police officer, to the children. "If you are being bullied, don't hold it in. Talk to someone. Tell a trusted adult and they will help you." "Don't sit in silence," added LaKeisha Newsome, Henry County Schools at-risk coordinator. "If you tell someone, and they don't do anything, then tell someone else. And if they don't do anything, then tell another person. Tell someone until someone does something and provides you with help." The guest speakers also spoke on the consequences of bullying, which can extend far beyond a simple reprimand, but can have criminal consequences. "You might think that if you're bullying someone that you're just having a bit of fun, but if you cross the line, you will have to deal with adult consequences," said Newsome. "Bullying is against the law and, if you take it too far, you will get in trouble with the law," added Sapp. "It's not worth it." 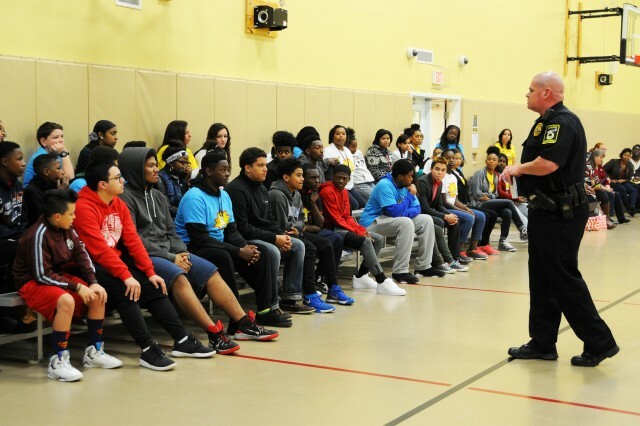 They also spoke about the emotional effect that bullying can have on the victim, which in extreme cases can lead to suicide, which is why officials wanted to bring the message home for the teens to speak up. "You have teachers, counselors and so many others here who care about you, so please if you're having an issue, then say something," said Sapp. Erica Clayton, military family member, said she realized during the two-hour campaign that she might have bullied another and not realized what she had done. "I see now that I might have bullied someone and not really knew it," she said. "I can learn from other people's mistakes and what I can do to maybe help stop bullying. I've learned that it can be stopped without violence and without hurting other people." "Some people can stand up for themselves, while others are quiet," added Josiah Berry, fellow military family member at the youth center. "The more people who bring up that they're being bullied, the more people will want to step up and try to help that person." Kearias Washington, also a military family member, said that it can be easy to be bullied, especially if you're the new kid in school, but someone making a simple gesture can mean the world to a new student. "We can do things like invite people to our lunch table to help them make new friend, and things like that, because that's kind of what I had to do with being a new kid in a new school," she said. "I'm glad I had people to take me in as their friend, so I would do that for others."